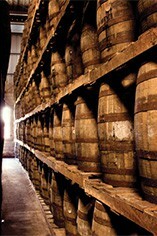 A Carribean premier rum El Dorado 15 Year Old Special Reserve is perfect for long sipping, straight or on the rocks. 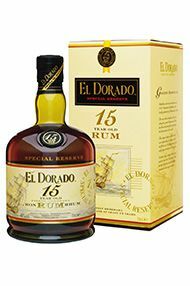 El Dorado Rum is a Rum brand produced by Demerara Distillers in Guyana. One of the smoothest tasting rums available, Demerara Distillers is known not just for the production but also for the marketing of its rums which focuses on the well-known legend surrounding its name. The story tells of explorers who travelled to Guyana in search of a fabled golden city known as El Dorado. The tale describes a king who wore a fine dust of gold all over his body; to the explorers he appeared to be made of gold. The legend continues to describe the king's city (Manoa, in Rupununi, in the heartland of Guyana) as being constructed of pure gold, just like its king. The flavours of the oak wood from the barrels and the complexities of the interaction between wood and spirit are greatly enhanced by the tropical climate of Guyana. The ageing process there is greatly speeded up by the high humidity and steady temperature – resulting in an El Dorado 8 year old rum, for instance, having a maturity of an older rum produced in colder climates.